SpaceX release an animated simulation of how “the most powerful operational rocket in the world” will look. 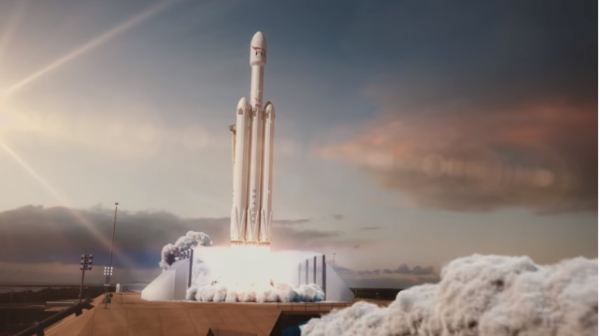 When Falcon Heavy lifts off, it will be the most powerful operational rocket in the world by a factor of two. With the ability to lift into orbit nearly 64 metric tons (141,000 lb)—a mass greater than a 737 jetliner loaded with passengers, crew, luggage and fuel–Falcon Heavy can lift more than twice the payload of the next closest operational vehicle, the Delta IV Heavy, at one-third the cost. Falcon Heavy’s first stage is composed of three Falcon 9 nine-engine cores whose 27 Merlin engines together generate more than 5 million pounds of thrust at liftoff, equal to approximately eighteen 747 aircraft.
? Tesla To Sell Solar Products In 800 Home Depot Stores Starting This July Venice Canals Dry Up Following Super Blood Moon And Weeks Without Rainfall ?